Home / Health / Healthy habits / Refrigeration Health Precautions: Foods you should be keeping in the fridge revealed! 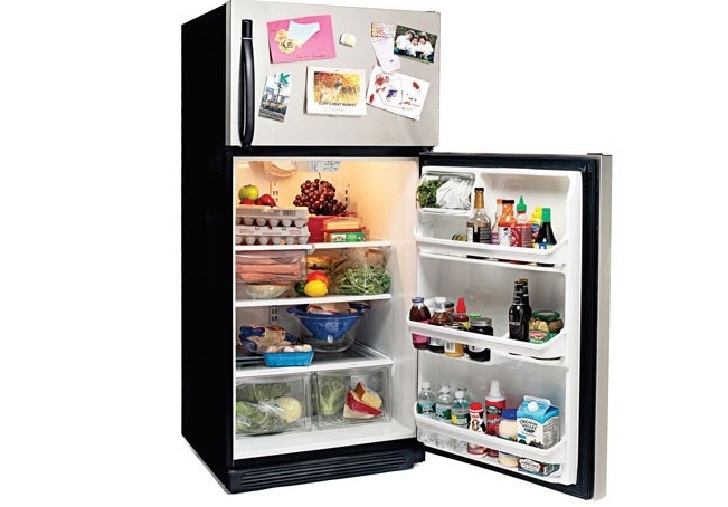 Refrigeration Health Precautions: Foods you should be keeping in the fridge revealed! Source of intense heat – cookers, ovens, radiators, boilers, etc. Direct sunlight – from window or skylights. Barriers to adequate air circulation. It’s important as it helps equipment perform efficiently and prevents a potential damaging build-up of ice. Presence of ice on the evaporator or internal surfaces indicates the need for urgent defrosting; if the equipment is designed to defrost automatically this also indicates a fault. Automatically defrosting may lead to a temporary rise in air temperature; this is normal and will not put food at risk. Clean thoroughly inside and out at least every two months as blocked drain lines, drip trays and air ducts will eventually lead to a breakdown. If possible, transfer stock to available alternative storage. Clean interior surfaces with lukewarm water and mild detergent. Do not use abrasives or strongly scented cleaning agents. Clean exterior and dry all surface inside and out. Clear away any external dirt, dust or rubbish that might restrict the circulation of air around the condenser. Switch on power, check when the correct working temperature is reached, refill with stock. Ensure that there is adequate capacity for maximum stock. Check that perishable goods are delivered in a refrigerated vehicle. Only fill frozen food storage cabinets with pre-frozen food. Never put hot or warm food in a refrigerator unless it is specially designed for rapid chilling. Ensure that no damage is caused to inner linings and insulation by staples or nails in packaging. Air must be allowed to circulate within a refrigerator to maintain the cooling effect – do not obstruct any airways. Hygiene precautions of the refrigerator. Select the appropriate equipment for the temperature requirement of the food. Always ensure refrigerators maintain the correct temperature of the food stored. Keep unwrapped foods, vulnerable to contamination, and flavor and odor transfer, in separate refrigerators or in airtight containers and away from products such as cream, other dairy products, partly cooked pastry, cooked meat, and delicatessen food. Do not store foods for long periods in a good, general-purpose refrigerator because a single temperature is not suitable for keeping all types of food safety and at peak condition. Never keep uncooked meat, poultry or fish in the same refrigerator, or any other food that is not its own sealed, airtight container. Never refreeze foods that have been thawed out from frozen. Always rotate stock in refrigerator space. NOTE: Maintenance and servicing of refrigerators should be carried out regularly by qualified personnel. It was the opinion that split the nation like Marmite – should ketchup be kept in the fridge or in the cupboard? An Asda store sparked the heated debate by revealing it had moved the condiment to the fridge. But the chain is now stocking its own brand on shelves and in fridges at its superstore in Clapham, South London. Clearing things up, microbiologist Dr. Peter Barratt said ketchup is best kept in the fridge as it now has less salt – which acts as a preservative. Even though most fridges come with an egg tray, laws in the UK mean all hen eggs must be vaccinated for salmonella, so British eggs don’t need to be kept chilled. Look for the British Lion mark as it means the eggs have been laid by vaccinated hens. Don't store unripe bananas in the fridge as it disrupts the ripening process – and even if you remove them later, it may not resume. But keep them away from other fruit as they produce ethylene, causing other fruits to spoil more quickly. You might think to keep bread in the fridge will make it last longer but it dries it out and will make your loaf go stale faster. The cold temperature forces starch in it to crystallize quicker than at room temperature. Store bread in a cool, dry place. There are no ingredients in mustard that spoil but manufacturer French’s says Dijon and horseradish will “lose their flavors if not refrigerated”. With sauces like apple and mint, it’s best to keep them chilled. Most fresh herbs should be chilled but basil wilts faster in the cold and will absorb smells around it. Keep it in water. If you’re looking forward to a pancake on Shrove Tuesday, you’ll probably be digging your syrup out from the back of the cupboard – because that’s where Philippa says it should be stored. Philippa says when it comes to pickled items, you should keep them in the cupboard but make sure you don’t contaminate them with a dirty utensil. Store it in an airtight container in the cupboard and if you have a lot, use a freezer. You might be tempted to pop them in the fridge salad drawer but tomatoes lose more of taste the colder they get, which also stops the ripening process. Unless your most recent Bake Off showstopper creation contains real cream or icing that will go bad if not kept cold, you don’t need to keep cakes in the fridge. The team at Good Housekeeping Institute say it’s fine to store them in an airtight container at room temperature. If you don’t plan to eat your blueberries, strawberries, and raspberries immediately, Philippa says to put them in the fridge. Put unfinished bottles in the fridge instead of on the kitchen counter. Lemons should be kept in the fruit bowl, according to Philippa. It's almost impossible to spread butter straight out of the fridge and food safety expert Dr. Lisa Ackerley says you can keep smaller quantities in a butter dish at room temperature – but for no longer than a few days as she says “it will go rancid if you keep it for long periods”. Jam is naturally acidic thanks to its fruit content, which helps to prevent the growth of bacteria, and if you eat it within three or four months you can keep it in the cupboard as long it doesn’t become contaminated. Branston recommends keeping pickle chilled but there’s really no need. Philippa says: “Pickles and chutneys are used to preserve ­vegetables. If you’ve got creamy salad dressings, store them in the fridge. But for dressings made of just oil and vinegar, they will be fine at room temperature as long as they aren’t contaminated.